Over £3 million of taxpayers’ money has been lost by the Department for Education, through unrecovered payments to failed university technical colleges for students who never enrolled. 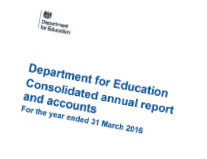 The DfE was unable to recover a total of £3,384,512 in pupil number adjustment clawbacks from the unsuccessful Royal Greenwich, Central Bedfordshire and Hackney UTCs, according to the DfE’s annual report and accounts for the year ended March 31, 2016. This is money that the department should be able to reclaim from institutions that have failed to recruit their forecasted number of students. However, in these cases the cash had to be written off due to financial difficulties at the three UTCs. The greatest loss was recorded by Royal Greenwich UTC, which failed to meet its forecast student numbers in 2014/15 and 2015/16 resulting in a PNA bill of £1,884,303 for the financial year. Between them, the three bodies failed to fill around 700 places between 2013/14 and 2015/16. According to the DfE report, Royal Greenwich was “financially unsustainable”, a situation which eventually lead to its absorption into the forthcoming University Multi Academy Trust in February 2016. It was decided that passing the debt on would “place severe financial pressures” on it and put “its financial future at risk”, so the DfE elected to abandon its claim. Greenwich Council is now forking out £13 million to convert the UTC into a secondary school. Similarly, Central Bedfordshire UTC fell short of forecast pupil numbers in 2013/14, 2014/15 and 2015/16 – resulting in a PNA clawback of £768,209. It was shut down and had its funding agreement terminated on August 31, 2016. A deficit of £184,000 was taken on by Bedford College in September 2016, along with remaining pupils and staff. But in order to close Central Bedfordshire UTC in “a solvent position”, the DfE chose to again abandon the PNA claim. Hackney UTC, one of the first of an increasing number of UTC closures, did not meet forecast pupil numbers for 2013/14, resulting in a PNA clawback of £817,000. It went into liquidation in August 2015, with financial assets estimated at £85,000, which the DfE report states resulted in a loss of £732,000. Charles Parker, chief executive of the Baker Dearing Trust, which develops and promotes UTCs, said he regretted the cost of the closed UTCs. “The decision to close any UTC is only ever taken when there is no realistic alternative,” he said. A DfE spokesperson said: “We are not complacent, which is why we are strengthening the UTC programme through a number of reforms to make it more sustainable. Julian Gravatt, assistant chief executive of the Association of Colleges, said: “Hopefully the DfE will have learned lessons from the early years of the UTC programme.